Adventure #284 (May 1961) - The Charge of Aquaman's Sea Soldiers! The aquatic duo must deal with a brilliant but malevolent scientist bent on outsmarting them. Aqua-Exclamations: By King Neptune's Beard! Great Guppies! Leaping Lizardfish! Jumping Jellyfish! Great Waves! Stuttering Sea Horses! Holy Sea Cows! Captured/Knocked Out report: Aquaman's sea creatures become very weak in the de-salted water. Quotefile: Aqualad, "Leaping Lizardfish! Look, Aquaman! What in the Seven Seas is that?" Finny Friends Report: Aquaman and Aqualad arrive riding on octopi. Sawfish saw the boarding plank in half, stranding the raiders on the ship. Archerfish shoot seaweed stalks at the raiders guns to disarm them. Pufferfish bail out the hold of the victim ship until it can make port. Swordfish attack the inflatable boat, punching holes in it. Flying fish net the attackers with a seaweed net. An octopus hauls the attacker aboard their targeted ship. Aquaman summons an armada of fish, but the sailfish are unable to jump aboard the deck of the boat. The octopi fall into the water from weakness. The blue whales lose strength and bump into each other. A squadron of octopi are also unable to board the ship. Aqualad ushers them out of the area once Aquaman realizes the problem. The specially outfitted fish return with Aquaman and Aqualad to attack Professor Snark's set up. Aqualad rides a dolphin, Aquaman an octopus. Whales smash the side of the de-salting machine. A batfish knocks a gun out of a thug's hand. A porcupine fish knocks over another thug. Swordfish knock over the salt bins, and octopi throw sea shells at the thugs. 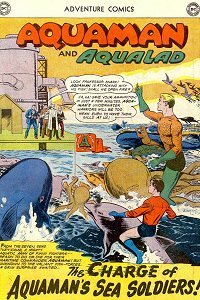 Aquaman and Aqualad jump aboard the de-salting barge in a whale's spout. Aquaman rides off on a dolphin, and Aqualad on an octopus. Not really impressed with this one. Aquaman should have figured out the de-salted water thing much quicker. And the idea of outfitting the fish with scuba gear is actually very very silly. So, yeah, not my favorite. But then, we're moving into an extremely silly era of comic books, so there's worse to come. On another note, this is Aquaman's last appearance in Adventure Comics for awhile. It'll be another 13 years before he returns to the title that he spent most of his career in.